Don't Lose your Garmin GPS! There are four different Windows compilers+IDEs mentioned for use with the board in STM's materials. These are evaluation versions, limited in executable size, with the licensed versions generally costing more than a student/hobbyist would like to spend. This article explains show to use ARM's free GNU Tools for ARM Embedded Processors toolchain, a port of GCC maintained by Advanced RISC Machines (ARM Ltd) for the Cortex-R/M families for "bare metal development" which includes glibc support. These instructions have been tested for Ubuntu 12.04 LTS, GNU Tools for ARM Embedded Processors 4.8-2014q2, and 2013.03.06 commit of STLINK. They may also work for other versions. I am using the GNU Tools for ARM Embedded Processors toolchain. This GNU toolchain is maintained by ARM for the Cortex-R/M families for "bare metal development." It includes glibc support. On the download page, grab the Linux current installation tarball. Download this to your home directory and unpack it using something like this, but get the current release if there is a newer one. 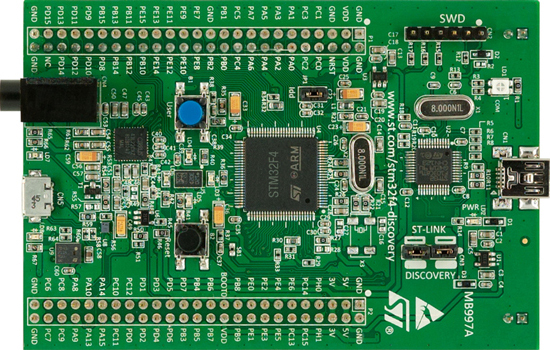 The F4 Discovery board uses an interface called STLINK for programming and debugging firmware. The software that talks to the STLINK interface is also called STLINK. It's not important how this app works, the idea is just to get something that works, then try building it and programming it to the F4 Discovery board so that we can verify the build/program/run sequence works. The burn target programs the flash using st-flash. After the flash programming completes, press the black reset button on the F4 Discovery and the code will run. Use an ATX PC power supply as a 5V, 3.3V, and +12V/-12V bench supply the easy way, without cutting the case or mounting external connectors, resistors, LEDs, switches, and fuses. Provides visual indication when supply is plugged in and turned on, also fuses the power voltage outputs for safety. Run USB powered development boards via the USB connectors on the 5V line. USB serial port with standard, 5V and 3V RS232, plus integrated null modem and gender changer. Implements TX/RX and RTS#/CTS# for optional hardware handshake.